Get tack-sharp pictures the EASY way with the RED Pod! The Beanbag with a BOLT! THE POD is a product I've used for several years now that can be used as an alternative to a tripod to get really sharp pictures. I find it to be one of the BEST inexpensive photo investments at a fraction of the cost and weight of a tripod. In many different situations, THE pod can deliver results that far exceed that of most tripods. We carry two versions of the POD: Green and Red. The Green Pod is for DSLRs with zoom lenses and the Red Pod is for camcorders, point-and-shoot cameras or small DSLR cameras. Click here for more information on the two styles of POD. I've used the POD at sporting events, wildlife sanctuaries, national parks, while hiking, inside buildings, etc., etc., etc. It's one of the most versatile tools I have. 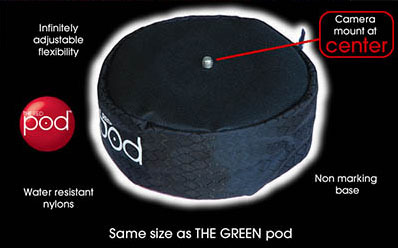 The POD can be used with DSLR cameras, Point and Shoot cameras, almost ANY camera that has a tripod socket! We've been able to get tack-sharp images in difficult shooting conditions where a tripod couldn't be used. THE RED pod attaches to the bottom of you camera on the tripod mount and supports both your camera. It weighs very little (0.75 pounds) so you can attach it to your camera and forget it's there until you need it. THE RED pod offers great support for compact digital cameras, small DSLR's and camcorders (the GREEN Pod is for DSLR's with zoom lenses and larger camcorders). The centered tripod mount connects to the camera body. Small and light enough to stay on your camera or tucked into your camera bag for whenever (we use it in our camera bag to cushion the camera). Set it up on any handy surface like cars, rocks, fences, benches, trees, the side of a building, on your spouse's shoulder, etc.